It's officially summer, and if you're going to juice this is the best season to do it! I have pretty strong feelings against juicing actually, but for some reason have been craving a super green, fresh juice and had to make it happen today. 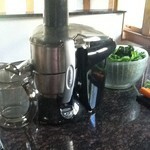 Considering the "buzz" around juicing and its health benefits, I thought I should give my input. Yes, juicing your vegetables involved removing all the juice (sugar), as well as the water soluble vitamins & minerals into the concentrated juice, which is where it gets it's "super powers"! Juicing eliminates the fiber from the fruits and vegetables you juice thus increasing it's ability to be absorbed and utilized in your system. Because you are eliminating the fiber you end up with a lot of leftover mushy unusable produce once you've juiced out to water, vitamins, minerals, and sugar. This kills me! 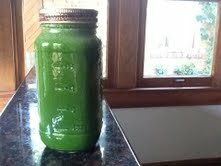 I spend all this time getting me veggies washed, chopped, and juiced, to be left with a measly little jar of juice. I would rather eat the veggies! Juicing is extremely wasteful if you have a crappy juicer. The better ones will have less leftover produce when you're done, they can be pretty pricey. I got mine at Costco for $150 or so, it's a Juiceman, and I think relatively middle of the road when it comes to juicers. It completely defeats the purpose if you use non-organic produce to do your juicing. The toxins used to grow your non-organic foods will end up extremely concentrated in your juice. You don't want that! Even organic produce needs to be washed well before juicing. I use grapefruit seed extract to wash all my produce, it's a natural antimicrobial, and thus kills any bacteria that may be present on your food. Juicing Greens is just Sad! Yes, it's unfortunate that some organic farmer spent the growing season caring for your beautifully grown spinach, and kale, and cabbage, only for you to squeeze out 2oz of juice and throw the rest away...sad! 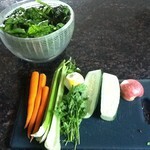 However, if you are going to juice you gotta have greens in there! In my experience, spinach juices the best, kale is the worst (just eat it), and cabbage is actually so-so. I typically juice 1-2x/year (literally) and always use fresh spinach. My favorite juice recipe involves a special trip to the store as it's not stuff I just happen to have in my fridge. So, after I've made my special trip to the store to get my ingredients (30 minutes), I unload and get my big salad spinner out to start washing the spinach. Soak the spinach in grapefruit seed extract and water, drain, and spin dry (5 minutes). Set up another bowl of grapefruit seed extract and water to wash my cucumber, carrots, celery, parsley, lemon, and apple (5 minutes). Peel carrots and ginger, slice off most of lemon peel (a few more minutes). Get the juicer out, plug in, set up and we're ready to juice!! Start with the greens, and then the order doesn't matter from there. Once everything has gone through, you have about 10 minutes of clean up to do. Dump all wasted fiber in the trash unless you trust your disposal (I don't!). Wash all pieces of the juicer well (there are like 5 pieces that need to be disinfected and thoroughly cleaned). You can get them in the dishwasher if you prefer. That's like 50 minutes for a 20oz jar of juice that needs to be consumed within 2 days. You decide if it's worth it! This is a great "detox" recipe, as the ginger, lemon, and parsley have anti-inflammatory and digestive health properties. The apple is really there fore flavor, you don't even need it. Celery is a filler for me, not necessarily a nutrient dense choice, but it provides juice! Spinach is packed with vitamin C, phytonutrients, and calcium. And the carrots are great sources of carotenoids (precursors to vitamin A).